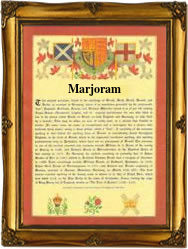 Recorded in many forms including Margeram, Margram, Margarum, Margrem, and Marjoram, this is an English surname. It has been claimed that in England it originates from the region known as East Anglia and more specifically the county of Norfolk, although we have not been able to provide any early evidence as such. We do know that it is a surname which is derived from a herb called "majorane or mageram", and this may have been introduced by the Romans in the First Century a.d., and perhaps again by the Norman French after the Invasion of 1066. The plant was apparently in considerable demand in the medieval times, and it would seem formed an ingredient within the many potions and pottages used for the attempted cure of the various plagues and diseases. This suggests that the name was occupational for a herbalist, the most successful healers before the invention of plumbing and sanitation. We are able to show that the name was relatively popular in the diocese of Greater London from the 17th century, and it may well be that other epicentres exist within the British Isles that we have not yet identified. These examples of recordings include Elizabeth Margrem who married James Morns at St Botolphs Bishopgate, on April 2nd 1656, Ann Margerum, who was christened at St Sepulchre church, on March 28th 1680, and Ann Marjoram, christened at St Helens Bishopgate, on April 28th 1769.